NBC Bay Area Forecaster Vianey Arana previews a day starting with cold temperatures followed by hazy conditions. A Spare the Air alert is in effect for Monday, the fourth day in a row when wood-burning activities are banned, Bay Area Air Quality Management District officials said. 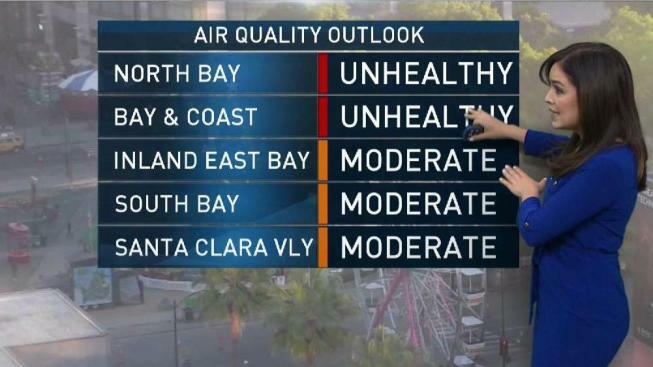 Air quality is expected to be unhealthy in the Bay Area Monday because of a high-pressure ridge clamping down on the area, trapping wood smoke pollution close to the ground, air district officials said. "One burning fireplace can impact an entire neighborhood as well as pollute air inside the home," said Jack Broadbent, executive officer of the air district, in a statement. Broadbent added, "During the recent Northern California wildfires, Bay Area residents experienced firsthand how quickly smoke can saturate the region." However, air quality officials said in a news release that smoke from the wildfires raging in Southern California will remain aloft and will not impact air quality in the region Monday. The Winter Spare the Air season's first three alerts were announced on Thursday. At that time, the air district issued alerts for Friday through Sunday. During Spare the Air alerts, it is illegal for residents to use their fireplaces, wood stoves, outdoor fire pits or other wood-burning devices.